On June 17th, 2018 an Australian company named South32 (ASX:S32) agreed to buy the remaining 83% of shares in Arizona Mining (AZ-V) in a deal that values all of Arizona Mining at $2.1 billion Canadian pesos. The fully funded price is an all cash offer. When they read about the proposed takeover, the management of ZincX all smiled. 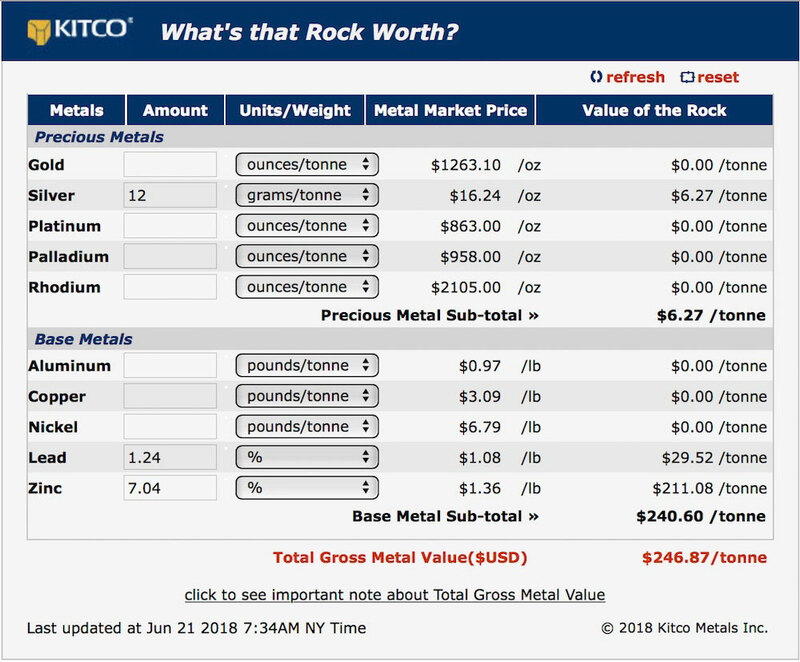 Now they know what an all cash offer would look like for their similar lead/zinc/silver project. Most times it becomes difficult to measure one company against another since there are so many variables. In a comparison of ZincX to Arizona Mining, it’s actually fairly easy because their published 43-101 resources are so similar in nature. In the indicated 43-101 resource for Cardiac Creek of ZincX published in November of 2017, ZincX showed 22.7 million tons with a metal in the ground value of $295.15 per ton for a total of about $6.7 billion USD. The same table for the 43-101 resource in the inferred category for the Cardiac Creek deposit shows just over 7.5 million tons with a metal in the ground value of $246.87 and a total of about $1.86 billion USD. For Arizona Mining in the M&I category their most current 43-101 from January of this year shows 100,958,000 tons with a metal in the ground value of $257.65. In the inferred category the same 43-101 reported 43,069,000 tons with an in the ground value of $284.65 per ton. Those numbers were easy to compare because they are measuring similar type metal deposits. The Indicated resource for ZincX is about 20% higher than the M&I resource for Arizona Mining. The Inferred 43-101 resource for Cardiac Creek of ZincX is about 20% lower than the Inferred numbers for the Taylor Deposit of Arizona Mining. 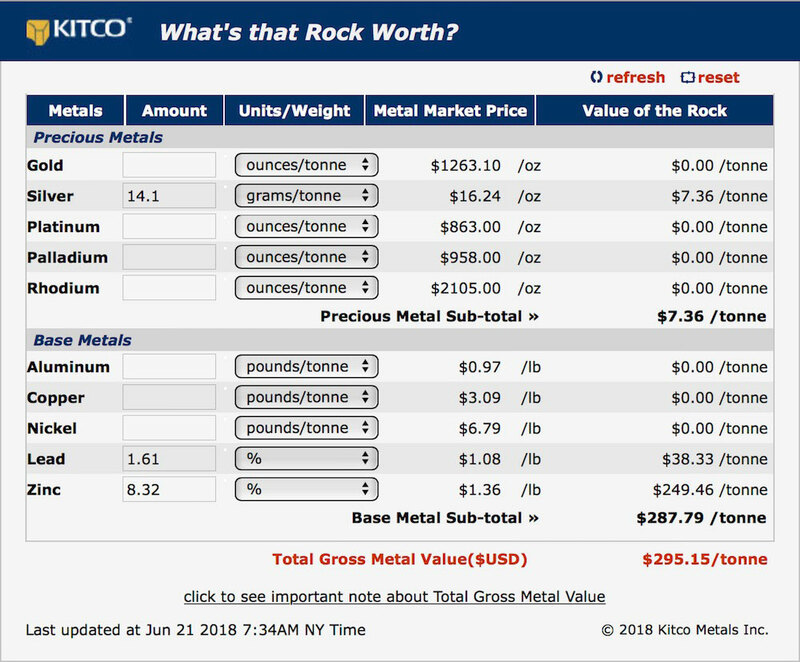 If you work out the numbers roughly given that we are working with tons and the USD values, for the Taylor Deposit of Arizona Mining we get a total in the ground value of just over $38 billion. Of course that isn’t their only project, they also post numbers for what they call the Central Deposit but here you have a problem of mixing apples and oranges. With almost 70 million tons of rock, the Central Deposit has great value but it’s really a manganese deposit with some zinc and silver added in. In any case, I worked up rough numbers and figured that the Central Deposit has an additional $30 billion worth of rock in the ground. 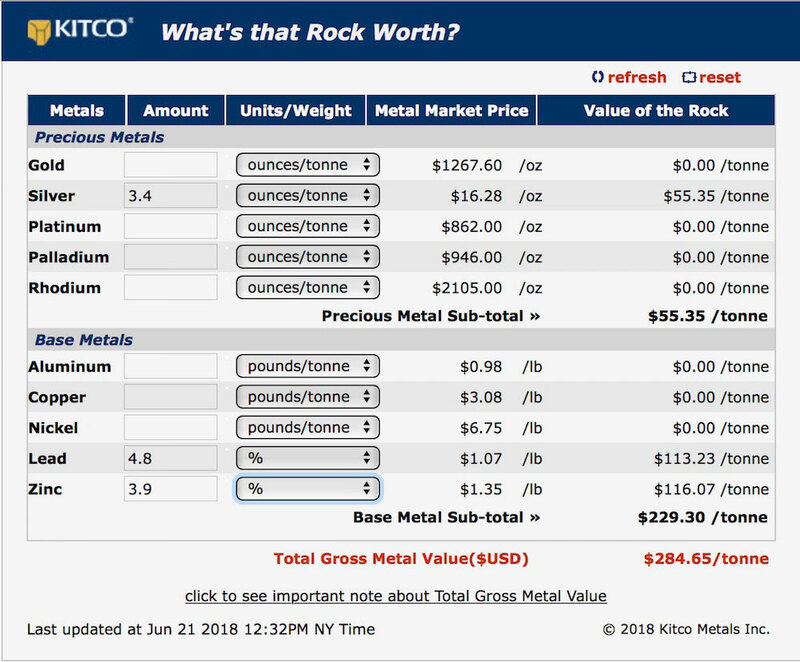 So for Arizona Mining we have a total of about $68 billion USD in an in the ground rough value and a total purchase price by South32 of $2.1 billion Canadian. Which is about $1.575 billion. USD. 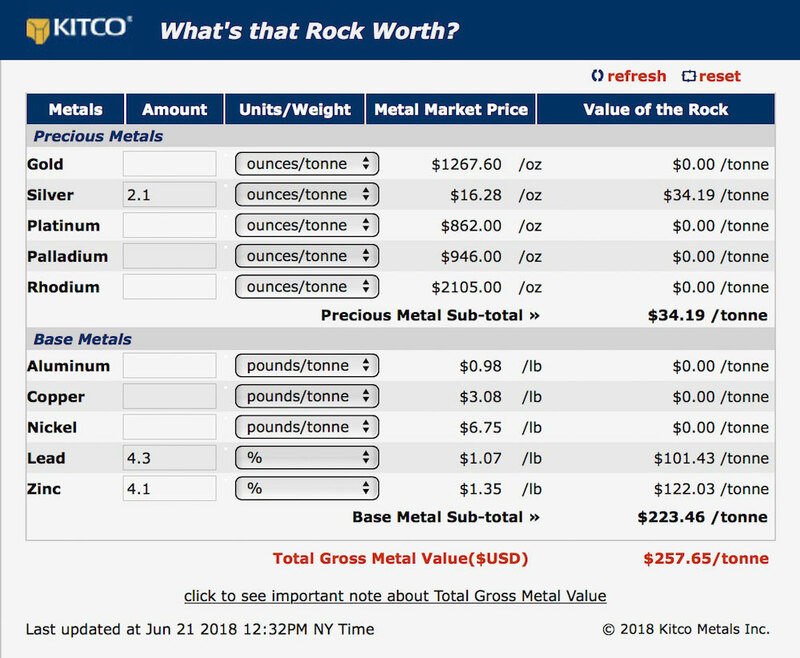 So South32 is paying 2.31% of the rough metal in the ground value for Arizona Mining. As I write, ZincX shares are selling for $.35 CAD. That gives the company a market cap right now of $58.2 million CAD or $43.9 million USD. 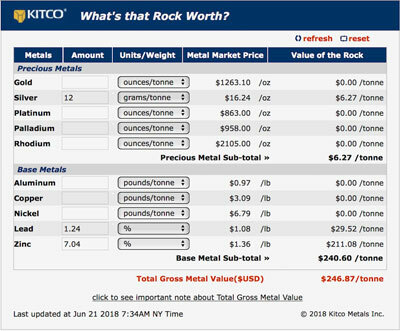 If South32 paid the right price for Arizona Mining (and it’s all in cash) and they paid 2.31% of the metal in the ground value, it’s a simple math problem to say that ZincX with a similar silver/lead/zinc project should be worth 2.31% of $8.56 billion USD or $197 million US or $262 million CAD. That makes ZincX very cheap. Cardiac Creek is 100% owned. Arizona Mining uses a figure of 3% for an average NSR. ZincX has no NSR. There are a whole bunch of differences between the two companies all of which are more favorable to ZincX. ZincX just released a PEA on June 20th giving very interesting numbers. Shares in ZincX are up almost 50% in a week since the South32/Arizona Mining announcement. I think they are going to go a lot higher. I’m not the only person doing the math. ZincX is an advertiser and naturally I am biased. Do your own due diligence. I have bought shares in the open market.